During his prep and college Wrestling careers, Dan Gable compiled an unbelievable record of 181-1. He was undefeated in 64 prep matches, and was 117-1 at Iowa State University. His only defeat came in the NCAA finals his senior year. A quote from Gable about this loss is, “then I got good”. Gable was a two time NCAA National Wrestling Champion and three-time all-American and three-time Big Eight champion. He set NCAA records in winning and pin streaks and the pin streak still holds. After college, Gable added titles at the 1971 Pan American Games in Cali Columbia and World Championships in Sofia Bulgaria and in 1972 the Soviet Union’s famed Tbilisi Tournament in Tbilisi Georgia as well as Outstanding Wrestler. He won an unprecedented six Midlands Open championships and was that meet’s outstanding wrestler five times. Gable won a Gold Medal at famed 1972 Summer Olympics in Munich Germany without surrendering a single point. The Soviets came to the Olympics with only one goal in mind: to defeat Gable. They were unsuccessful. In Gable’s final 21 Olympic qualification and Olympic matches, he scored 12 falls and outscored his nine other opponents, 130-1. During his 6 matches at the Munich Olympics, he went unscored upon. As the University of Iowa’s all-time winningest coach from 1976 to 1997, Gable won 15 NCAA National Wrestling Team Titles while compiling a career record of 355-21-5, He coached 152 All-Americans, 45 National Champions, 106 Big Ten Champions and 12 Olympians, including four gold, one silver and three bronze medalists. The Hawkeyes won 25 consecutive Big Ten championships, 21 under Gable as head coach and four while he was an assistant coach and administrator. He had a winning percentage of .932 and captured nine consecutive (1978-86) NCAA Championships. At the time that equaled the longest streak of national titles won by any school in any sport, and is also held by Yale golf (1905-13) and Southern Cal track (1935-43). On only five occasions did a Gable-coached team lose more than one dual meet in a year. In fact, Gable’s teams averaged over 17 wins and just one loss per season. The 1996-97 season added the final chapter to Gable’s storied career. In late January, he underwent hip replacement surgery, missing four dual meets while recuperating. He reappeared in the Hawkeyes’ corner just in time to lead the team to their 24th consecutive Big Ten title and 17th NCAA title. Iowa shattered its own NCAA team points record, scoring 170 points during the three-day tournament in Cedar Falls, Iowa (UNI). Gable has been named to several Halls of Fame including but not limited to the USA Wrestling Hall of Fame, the US Olympic Hall of Fame, the National Wrestling Hall of Fame Stillwater, OK and is the name sake of the National Wrestling Hall of Fame Dan Gable Museum in Waterloo, IA. He was selected the nation’s outstanding wrestler by the AAU in 1970, and the US Wrestling Federation in 1971. Gable was the Amateur Wrestling News “Man of the Year” in 1970. In June 2002, he was appointed to the President’s Council on Physical Fitness and Sports. Several networks, including ESPN and HBO have aired documentaries on Gable’s life and accomplishments. Some of his most recent accolades include being named the top wrestler of the 20th Century by Gannett News Service; listed as one of the top coaches in the 20th Century by ESPN and named Iowa’s top “sports figure” in the past 100 years. In 1996, Gable was named one of the “100 Golden Olympians”, an honor bestowed to the top 100 U.S. Olympians of all time. During the 2012 Olympics Gable was inducted into the UWW Hall of Fame Legends of the Sport category. Only the 3rd person in the World to have this honor bestowed upon them at that time. Gable resides in Iowa City with his wife Kathy and has four daughters, Jenni Mitchell(Brian), Annie Gavin(Mike), Molly Olszta(Danny) and Mackenzie McCord(Justin) and twelve grandchildren, Gable, Danny, Jake, Elsie, Eliza, Betsy, Mickey, Louie, Archie, Sammy, Kate and Hank. During his prep and college careers, Gable compiled an unbelievable record of 182-1. He was undefeated in 64 prep matches, and was 118-1 at Iowa State. His only defeat came in the NCAA finals his senior year. 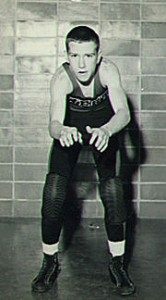 Gable was a three-time all-American and three-time Big Eight champion. He set NCAA records in winning and pin streaks. © Copyright 2019 Dan Gable. All Rights Reserved.